Knowledge Increases by Sharing, not by Saving – Coviam strongly follows what it preaches. 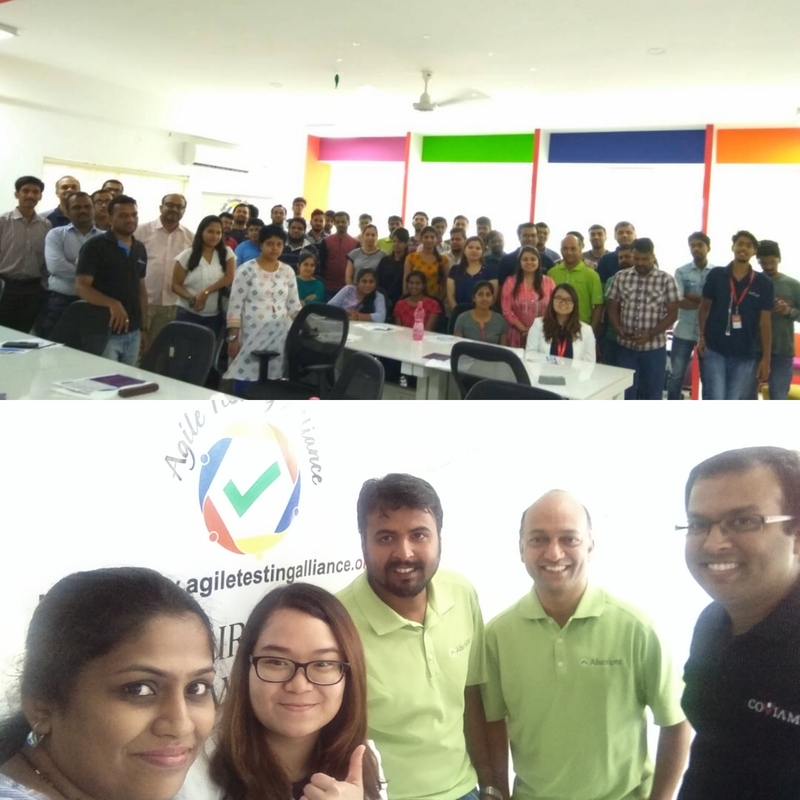 Coviam had the good opportunity to host the 13th ATA meetup on the 13th of May (you read it right) hosting fellow test engineers and QA practitioners across Bangalore. Meetups are a great platform for like minded professionals to mingle, share and learn something that is common to their profession. The Quality Engineering team at Coviam was very excited to host the meetup for ATA and waited with baited breath for the moment to arrive. The Digital Marketing team at Coviam was in full swing sharing posts on Social Media while teaming up with the ATA team. The initial registrations were encouraging and we saw about 70 participants registering and attending the event on the said date. It has been one of the biggest success stories for ATA meetups so far. The day started with registrations and a brief introduction about ATA and their coursework by Ms.Nishi Grover who is a veteran in the Agile testing industry. Coviam’s CEO Mr.Deepak Nachnani give an inspiring introduction to Coviam, what we stand for, the journey we have embarked on and the talent that we seek (Interested in Coviam? Do write to [email protected] with your resume). Deepak also shared some industry insights from his long drawn background in the IT industry. As we started our first topic for the day, “Mobile Test Cloud Environment” by Mr.Shrinath Acharya from Allscripts the attendees listened to rapt attention. Shrinath had a wealth of information on mobile testing in the cloud and best practices to follow, while also sharing tips on choosing the best cloud test suite. The next was a combined talk by Mr.Sundaresan from Coviam and Ms.Felicia Kartika from Blibli.com, Indonesia on Success Strategies for Microservices Testing. The duo shared some insights on the server architecture while discussing the testing challenges that a typical test engineer face in a Microservice environment. They shared tips on how to overcome these challenges with industry best practices that has helps deliver great quality software. After a refreshing fresh tea and a snacks break the attendees were awe-inspired learning about implementing Machine Learning for a Shift right testing approach by Mr.Santhosh from Allscripts. Santhosh with a proven background in implementing ML technologies shared how to learn from the continuous flow of data from your customers through various streams using the available ML tools. understanding Usability, the simple techniques that can help in our day-to-day testing and what test engineers overlook when it comes to Usability. There were many questions and discussions during the course of the presentations making the meetup true to what it was intended for, an interactive learning event. A special lunch was arranged for all attendees to helping them network with like minded test engineers. In all it was half-a-day worth investing in wealth of information shared and discussed. Indeed a huge success. Thanks to all the volunteers who made this possible.